Buttercups, sweet as can be. In fact, buttercups were originally bred in North Dakota by folks excited about its sweet potato-like flavor, homegrown in the up north – or so we’ve read. A taste of Polynesia in South Dakota. 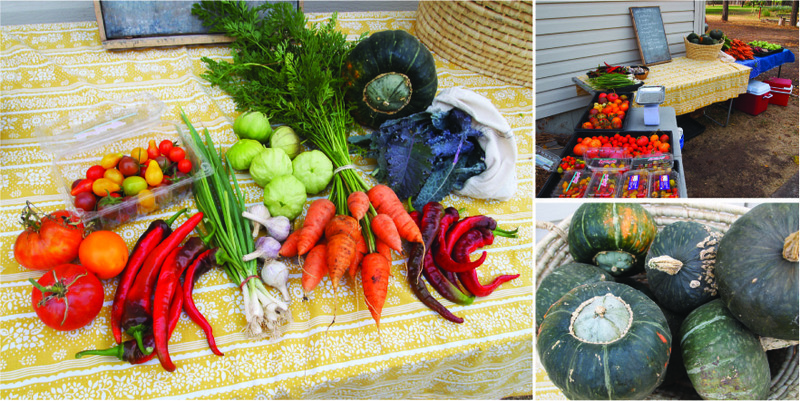 Here is a link to this week’s CSA newsletter and an update as to happenings on the farm these days. And here is a link to a very pretty video recipe for buttercup squash and maple syrup tatin. Jimmy Nardello and Hot Portugal peppers. In the photo of the share above, the Nardellos are on the right, Hot Portugals on the left. We knew they would look similar. They are planted in separate rows, we’ve been able to keep them apart with much deliberation. But side-by-side it’s silly. Hopefully this hasn’t caused too much trouble for our CSA members. At the on-farm pick up these past couple weeks, we’ve offered folks a rubber band to group the Jimmy Nardello peppers together, like they are cuddling. Because they are sweet. Otherwise, tossing Nardellos into a bag with the Hot Portugals would certainly lead to some questions later on in the kitchen. On the topic of pretty peppers, Jeremy just strung up the Chimayo chiles. We planted them as a test to see how well they would fare in South Dakota. They don’t have the traditional Chimayo Valley terroir, but they did fabulously. And we’re grateful to have these ristras to help keep us warm this winter. 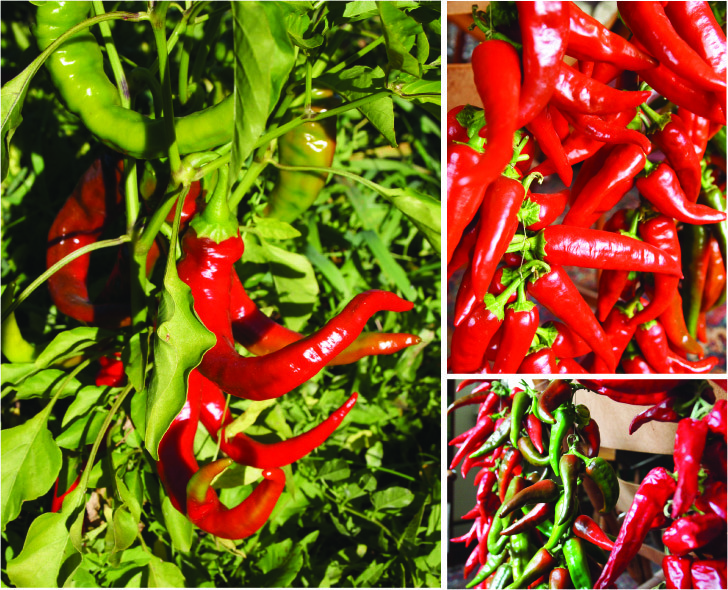 If you are interested in reading more about Chimayo chiles, here is a beautifully written article on Chimayo Chile Culture. In the rush of harvest these days we’ve been discussing the merits and drawbacks of the varieties we planted this season. Somethings are still growing and it’s too early yet to make any reasonable reflections. Valuable assessment is also made more challenging with the various eccentricities of this season (our initial poor watering system, the early high temperatures, the drought conditions, and this being our first year farming). 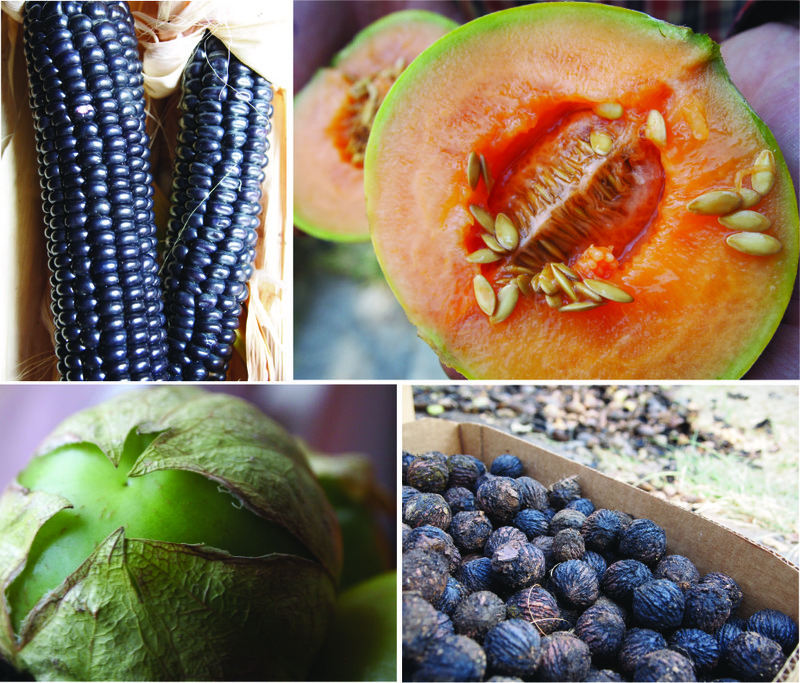 We are ultimately most excited about growing regionally adapted seed varieties. We deliberately chose varieties with short growing seasons and seed from similar growing degree day zones. However, being our first year farming (not knowing what would grow well, not really knowing much at all..), with some varieties we tried to push the limits a bit. We grew two varieties of cantaloupe. Neither of them had quite enough time to get all their precious fruits full and ripe. But of the few that ripened, Charentais is definitely the taste test award winner. SO GOOD. These were direct seeded this spring, maybe next year we can get them going earlier in the greenhouse and see if they yield better. The Taos Blue corn did fantastically. Seed for this came from a cob given to us by a gardener and beekeeper at the Arco Iris Permaculture Institute in New Mexico – longer daylight hours, but a comparable growing season length. We’re saving seed for several cobs to grow out again next year, but as we started from a very narrow genetic pool (one small cob of seed), we’ll have to keep an eye on this. The thai pea eggplant was a test, it was a stretch, and it didn’t pass. Pea eggplants grow like a cluster of grapes, and they grow to be about the size of a pea. Mom (Trish’s mom) gave us seed. And wishful thinking. The eggplants grew dense and massive. But never flowered. In their case, setting aside a difference of 30° latitude was a bit too much to ask. Sorry eggplants. Sorry Mom. There are countless considerations to make and numbers to crunch over the next couple months in preparation for next season. In order to make the farm sustainable we will need to increase our production, our share numbers, and share cost. Figuring out how to do that best is a puzzle – a good, sort of exhilarating mind teaser. Essential, if we want to continue farming. A challenge. Like all these black walnuts. This entry was posted in farm update and tagged CSA, seeds by Cycle Farm. Bookmark the permalink.